For nearly 10 years, Sophie Mouton-Perrat and Frédéric Guibrunet have combined soft lighting with delicate paper craft to create ethereal sculptures. 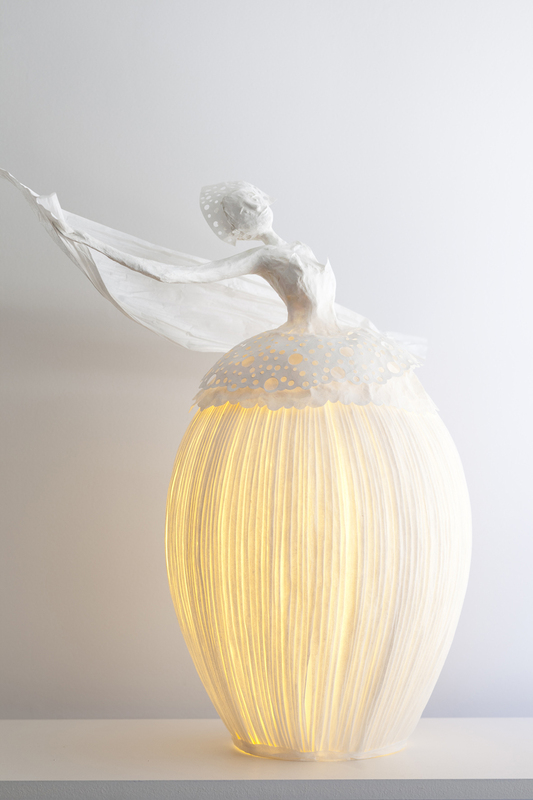 Working under the name Papier à êtres, the duo uses the papier mâché technique to construct life-sized women clad in elegant, billowing gowns that double as lamps. The top portion of the unconventional, all-white lantern features the ladies’ upper bodies while their pleated skirts illuminate the space. To produce these creations – which have been displayed in locales like the Paris Opera House – Mouton-Perrat and Guibrunet work in true collaboration. They are each responsible for half of the sculptures: Mouton-Perrat shapes the figures and concentrates on characters’ facial features, hair, dress, and graceful poses, while Guibrunet develops the base and lighting. Once assembled, the couple’s handiwork is a stunning fusion of art and technology. Although it appears as one cohesive piece, their individual contributions shine at separate times. When the lights are off, Mouton-Perrat’s beautiful details are visible. Once it’s dark, however, the exquisite yellow glow is all that’s seen.